In a world under siege by rampaging bears, only one man can stop the ursine threat, and his name is Shirtless Bear-Fighter. Found as a baby by a community of compassionate bears, Shirtless turned against his adopted species after a personal tragedy, devoting his life to stopping the bears that want to destroy humans. The new Image Comics miniseries Shirtless Bear-Fighter is a satire of action stories where the grizzled old soldier is thrust back in the field with a mission only he can accomplish, and this creative team leans into the silliness of this concept. Writers Jody LeHeup and Sebastian Girner reinterpret genre cliches with an irreverent sense of humor, and the art team of Nil Vendrell Pallach and colorist Michael Spicer has a crisp, animated style that intensifies the action while hitting all the comedic beats. Shirtless Bear-Fighter #1 hits stands next month, and The A.V. Club has an exclusive preview of issue #2, revealing more about the lead character’s mysterious past. The opening pages have Shirtless facing off against a wide variety of bears, a sequence that gets goofier with each panel as Shirtless fights teddy bears, the Chicago Bears, and gay bears in San Francisco. From there, the story embraces another action cliche as it reveals Shirtless’ time fighting in the Vietnam War, saving the life of the man who would go on to become his liaison with the U.S. government. This isn’t an especially complex comic, but this creative team is having a lot of fun telling Shirtless’ story, and that enthusiasm comes through on the page. 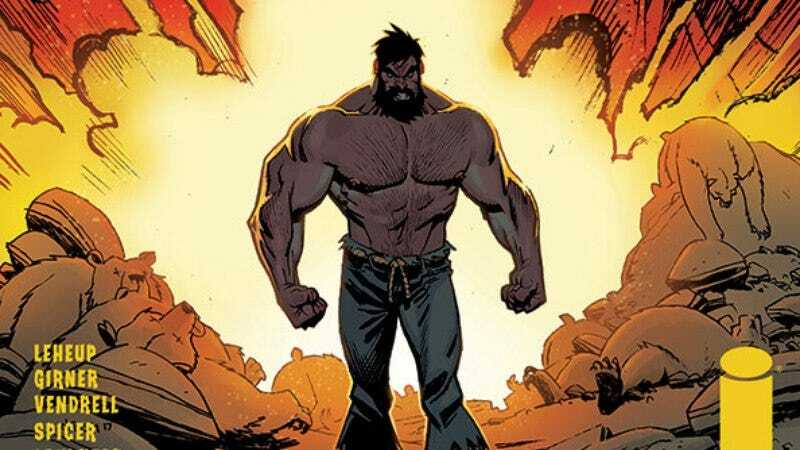 Readers can learn more about Shirtless Bear-Fighter when the first issue goes on sale June 21, and if they like what they see, they can grab the second chapter on July 26.